This glorious celebration of life combines the vibrant, hopeful colors of spring in a standing arrangement designed to inspire happy memories of times gone by. 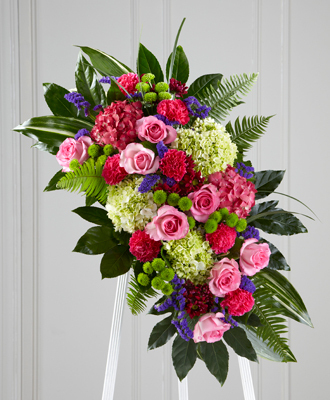 Handcrafted by a local artisan florist of bright and beautiful blossoms that include pink roses, magenta carnations, purple statice and hydrangeas, green button pompons and hydrangeas and daisy pompons all arranged against a background of lush green aralia and aspidistra leaves. It?s designed for display on an easel making an impressive, memorable expression of sympathy at a wake, funeral or graveside service. Product is not suitable for a residence.